Hello there, Gameologinauts, and welcome to our weekly thread for the discussion of weekend gaming plans and recent gaming glories. As you’ve probably heard, the Nintendo Switch is out today (I’ve spoken my piece about it). Maybe you even bought one and are playing it right now. Obviously, the game everyone will be playing on this thing is The Legend Of Zelda: Breath Of The Wild (which we’ve talked about at length here and here), but Nintendo itself is releasing two other Switch games. There’s 1-2 Switch, a collection of minigames that focus on the Joy-Con controllers’ nontraditional functions like motion sensing and “HD Rumble.” It’s a pretty inconsistent collection, but I had a lot of fun testing it out with friends—not $50 worth of fun, like Nintendo is trying to charge for it, but fun nonetheless. 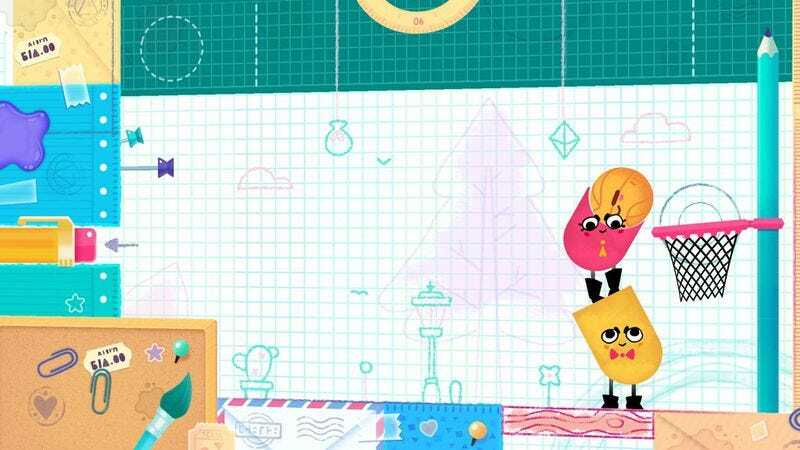 And then there’s a game I’m extremely excited to try this weekend: Snipperclips—Cut It Out, Together! (Yes, that’s the actual title, and yes, I’d rather die than ever type it out again.) It’s a game in which two players work together to cut their adorable geometric avatars into the shapes needed to solve puzzles. There’s also a single-player mode. As I’ve learned from playing it in the past, I’m absolutely terrible at it, but it’s charming as all hell and allows you to get pretty creative with your puzzle solutions, which helps with the whole being terrible at it thing.